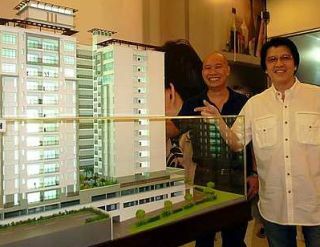 Selling fast: Tham (right) and sales and marketing manager Patrick Chin with the model of the SuriaMas Block C Apartment Tower. JOHOR BARU: Iskandar Malaysia and Singapore are two major contributing factors that will drive growth of the property market in south Johor. IJM Land Bhd general manager (southern region) Tham Huen Cheong said the country’s first economic growth corridor was moving in the right direction since its inception in Nov 4, 2006. Located in the southern most part of Johor, spanning 2,217 sq km and under its Comprehensive Development Plan (2006-2025), Iskandar will be transformed into an international metropolis. The figure released by the Iskandar Regional Development Authority showed Iskandar received RM62.32bil cumulative investment up to June, surpassing the 2010 target of RM47bil. “Developers are benefiting from the investment flow with demand for properties on the upward trend,’’ he said at the launch of SuriaMas Block C Apartment Tower. The project located in Larkin is a privatisation project between IJM’s subsidiary Suria Bistari Development Sdn Bhd and the Johor government. The 13-storey block with the gross development value of RM35mil is made up of 152 units with built-up area from 82.03 sq metre to 104.98 sq metre, and selling prices between RM220, 000 and RM330, 000 each. He said the opening of the two Integrated Resorts (IR) in Singapore also saw good demand for apartments units especially those located just few kilometres away from Bangunan Sultan Iskandar, Customs, Immigration and Quarantine Complex in Bukit Chagar. Tham said it was a known fact that Johor and Singapore were economically inter-dependent and positive economic growth on both sides of the Causeway would create a spill over. “Apartment units are popular with Malaysians working in Singapore as most of the apartments blocks are located within the gated and guarded precinct,’’ said Tham. He said many chose to stay in apartments nearby the CIQ due to the shorter travelling time commuting to work to the republic. The safety factor was another consideration as security guards patrolled the area regularly. Tham said apartments in the Larkin area fetched good rental due to its close proximity to Johor Baru city centre and was surrounded by amenities such as schools, banks, shopping complexes, private hospitals and public transport terminal. He said a three-room unfurnished apartment unit in the area could easily fetch RM850 monthly rental, while for the fully-furnished three-room unit could derive rental between RM1,200 and RM1,800. Tham said it was still considered cheap compared with a room in any Housing Development Board public flats in Singapore, which could be leased out to tenant from S$500 monthly.